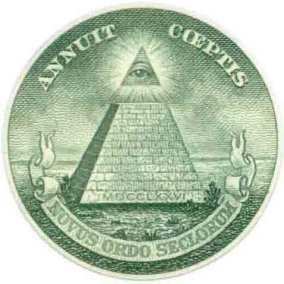 A favored subject for these conspiracy enthusiasts involves a man and Freemason by the name of Albert Pike. The story goes; Albert Pike was the Head of Freemasonry in the 1800’s and that he wrote a book called Morals and Dogma which spells out the regulations of being a Freemason. 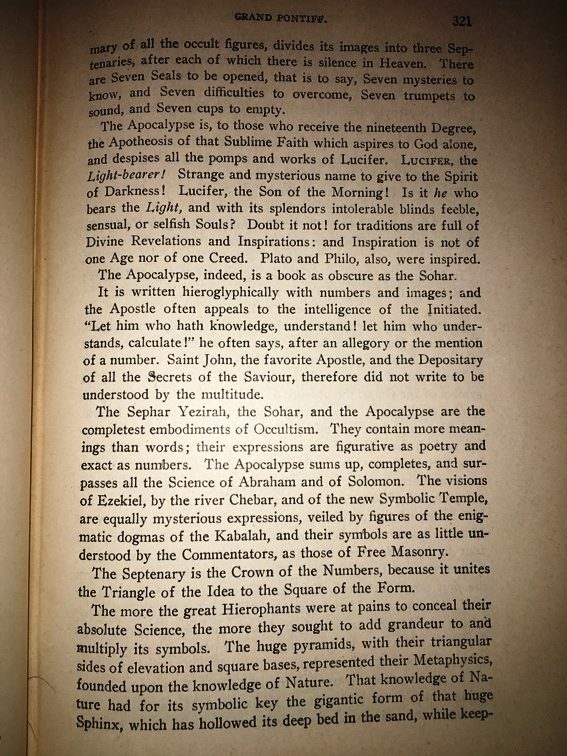 There is a passage that is recited over and over by conspiracy enthusiasts that “reveals” that the god of Freemasonry is none other than Lucifer himself! “That which we must say to the world is that we worship a god, but it is the god that one adores without superstition. To you, Sovereign Grand Inspectors General, we say this, that you may repeat it to the brethren of the 32nd, 31st and 30th degrees: The masonic Religion should be, by all of us initiates of the higher degrees, maintained in the Purity of the Luciferian doctrine. If Lucifer were not God, would Adonay and his priests calumniate him? When I first found this quote was I intrigued by it and wanted to look it up for myself. Ever since my earliest college days I was taught to always double check my sources so this seemed natural to me. The first thing I noticed was that although I could find the “quote” referenced in numerous places on conspiracy sites, always attributed to Albert Pike and Morals and Dogma, never once could I find a page number listed on any of these sites. That’s because it’s not real. 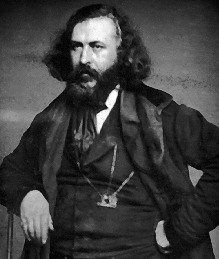 Albert Pike was a Confederate General who led a brigade of Native American soldiers during the American Civil War. He was credited as a crusader for justice for Native Americans, a prominent Washington lawyer and a philosopher. He was also a Freemason. He was not the head of Freemasonry. For several years he was the head of one jurisdiction of the Scottish Rite, an organization subordinate to Freemasonry. This was the was the Southern Jurisdiction of the Scottish Rite, which includes most of the western United States as well as the South. In 1871 he published a book called Morals and Dogma, in which he discussed a vast array of the worlds religions and tried to associate their mythic legends to the lessons taught in Freemasonry. This book was given as a gift to Scottish Rite Masons in the Southern Jurisdiction for nearly 60 years. It however, is not the “rule book” of Masonry as some people have claimed but rather the philosophical work of its author. The infamous “Luciferian Quote” does not exist between its covers. The origin of this “quote” is from a book entitles Woman and Child in Universal Freemasonry published by Abel Clarin de la Rive. The “Luciferian Quote” in this book is credited in a foot note to a woman by the name of Diana Vaughan. Diana Vaughan was a character introduced in the writings of a man named Marie Joseph Gabriel Antoine Jogand-Pagès who wrote under the pen name Leo Taxil. For obvious reasons I shall use the pen name when referring to him from here on. Taxil wrote what he called a history of Freemasonry, in four volumes which claimed to contain eye witness accounts of Masonic Satanic activity. Another book written in 1894 by Leo Taxil and “Dr. Karl Hacks” was titled the Devil in the Nineteenth Century. This is the book that introduced the character of Diana Vaughan who was supposed to have been involved in Satanic Masonry and an informant for Leo Taxil. The “Luciferian” quote has ever since been repeated by anti-Masonic conspiracy enthusiasts even though its real creator Leo Taxil admitted his hoax. That’s right! On April 19, 1897 Leo Taxil called a press conference with the pretension of introducing Diana Vaughan to the public. When the press was assembled, Taxil began a speech in which he admitted that he had in fact been perpetrating a hoax and that all of his secret information about Freemasonry was a fabrication. 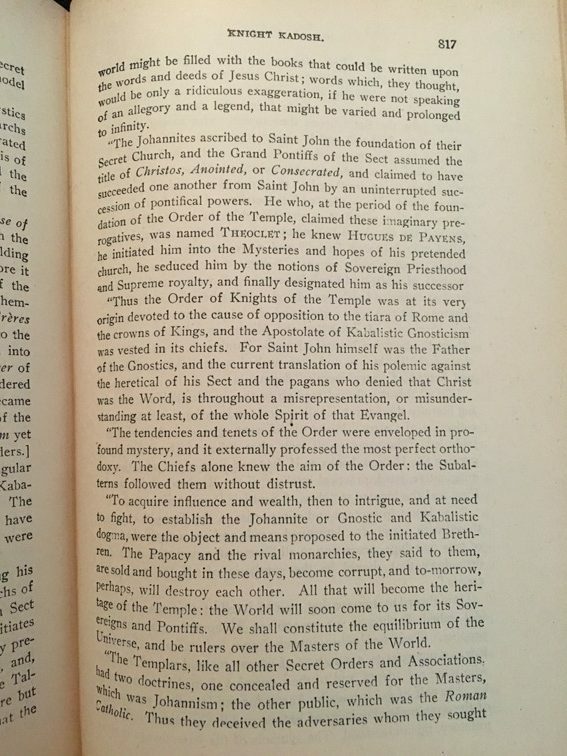 For rational people, this ended the concern over the “Luciferian Quote.” But the irrational and those who have a vested interest in hating Freemasonry still like to throw the quote around, attributing it to Albert Pike even though it is a well known fraud. The myth has been perpetuated by the preacher Pat Robertson, and it has been republished by Jack Chick in his Christian comic books since 1991. The quote can also be found splattered cross the internet on countless misinformed conspiracy sites. An elaborate hoax, even when its creator confesses his misdeed carries on down through the generations by liars and imbeciles who’d rather believe in fantasy than take the time to investigate the facts. It is no wonder they are so quick to condemn the hearts of others whom they don’t understand when they know full well the amount of deceit in which they themselves willingly participate. It is important to remember that facts are things, things that are REAL. They can be analyzed, scrutinized and proven. They exist because they do, not because you want them to or because you believe they do. So no matter how much they choose to believe otherwise and ignore the facts and the confession of Taxil, the infamous “Luciferian Quote”—often falsely attributed to Albert Pike is simply a fantasy. The image below was added in response to a commenter who claimed the quote exists on page 321 of Morals and Dogma. As the reader can see, it does not. Page 817 is offered too, because that was his initial (though admittedly wrong) page assertion.